Now that I have reached a somewhat venerable age, people have begun to ask me what my secret is. I flatter myself into assuming that they mean I seem oh-so-much-younger than the numbers suggest – “Younger than Springtime” Gordon used to say – and, when pressed, I’ve been giving answers. Of sorts. My Role Model! Mom (at 92) with Bear. I do believe that my mother is my Old Age Role Model. She was trying new things well into her nineties. 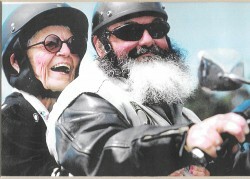 Nyel and I came back from a trip once to see her picture in the paper under the headline “Motorcycle Grandmamas burn up the Peninsula Blacktop.” And there was mom in a motorcycle helmet hanging on to Bear and laughing in delight! What a gal! For me, the ‘new’ thing I try to accomplish each day usually has to do with writing. (I did my motorcycle thing in my 20s and 30s.) And, no, my daily blog doesn’t count. There are some activities – like breathing and brushing teeth and a daily blog – that don’t really fall under the ‘maintenance’ or ‘new’ categories. For my friend Te, it’s walking 12,000 steps a day – it’s just what she does no matter what. As I see it, those are the ‘being alive’ trappings that don’t necessarily move things along. So just do it, shut up about it. 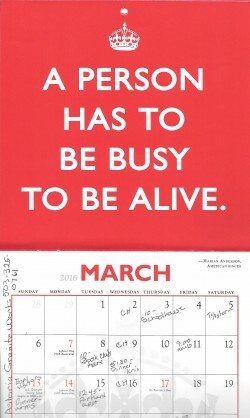 I think the calendar says most of it – be busy. As in keep moving forward, kind of like sharks. (Oh, wait! – That’s coming up for July. “Just keep swimming” it says.) But, I think those words to live by should include ‘meaningful’ and ‘fun,’ too. And, no, eating an extra piece of left-over birthday cake doesn’t count. Sydney, I have said it before and will say it again. You are my inspiration!